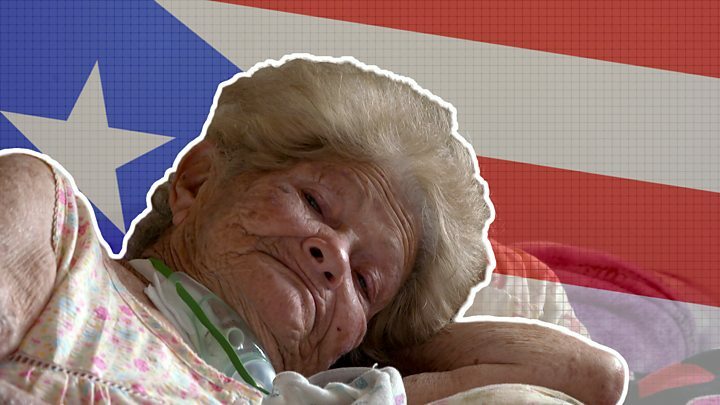 Officials in Puerto Rico now say 2,975 people died following Hurricane Maria - a devastating storm that struck the US island territory in September 2017. Governor Ricardo Rossello "accepted" the findings in a long-awaited independent investigation. The mayor of the capital, San Juan, accused the US government of deliberately downplaying the impact of the storm. "I'm giving an order to update the official number of deaths to 2,975," Governor Ricardo Rossello told reporters on Tuesday. "Although this is an estimate, it has a scientific basis." In a statement, the White House said the federal government supported the governor's efforts to "ensure a full accountability and transparency of fatalities" in the hurricane. President Donald Trump was criticised for praising the federal response to the hurricane-ravaged island in the weeks following the storm. Critics accused him of showing more concern for residents in Texas and Florida after they were hit by hurricanes. Why the change in numbers? 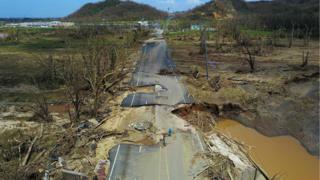 The authorities have faced criticism for underreporting the toll of Maria - the most powerful storm to hit the region in nearly 90 years. Until now, the official figure was 64 - even though the island had previously acknowledged the death toll was probably much higher. In the wake of the disaster, some experts estimated as many as 4,600 deaths. The latest findings - accepted by the island's authorities - were made in a report by experts from George Washington University, which the governor commissioned. The government's initial number was for those killed directly by the hurricane, crushed by collapsing buildings, drowned or hit by flying debris. But the new report also counted those who died in the six months following the storm as a result of poor healthcare provision and a lack of electricity and clean water. Repeated power cuts also led to an increased number of deaths from diabetes and sepsis. "This shows the magnitude of the catastrophe," Governor Rossello told El Nuevo Dia newspaper. When asked why his government was unable to recognise a higher death toll until now, he replied: "I am not perfect. I make mistakes. Now, hindsight tends to be 20-20." He echoed one finding in the report - that doctors "lacked awareness" on how to appropriately certify deaths attributed to natural disasters. "The responsibility for adjudicating the cause of deaths rested with the doctors," Mr Rossello said. "But unfortunately there was no formal process to prepare them for this kind of devastation. "At that moment, that was the number [of deceased] that we had and today we have the evidence which indicates the number was definitely higher." San Juan Mayor Carmen Yulin Cruz told the BBC that there had been "neglect" by the Trump administration and some local officials hadn't wanted to confront the president about the need for more aid. "It seemed like it was better to dance to President Trump's tune than to tell the truth that we were all seeing." she said. "I did was I thought ought to be done as I screamed, literally, out of the top of my lungs to say 'We're dying here' and the bureaucracy and the inefficiency of the federal government was killing us." For close to a year, Puerto Rico's government has clung to the idea that 64 people died as a result of Maria. That figure was always risible - particularly when you consider that the 150 mph (241 km/h) winds caused around $90bn worth of damage and left households for, on average, 84 days without electricity; 64 days without water and 41 days without cellular telephone coverage. In truth, the new official number is still an estimate - based on mortality data and taking into account historical data on migration patterns. But the official recognition will allow the island to move on and focus fully on rebuilding its infrastructure and extracting the tens of billions of dollars needed from Congress to give the three million inhabitants of this already bankrupt territory something of a future. Researchers tracked the number of deaths using death certificates and other mortality data between mid-September 2017 to mid-February of this year. The Caribbean island is home to 3.3 million people, some 8% of which have since left the island, the study said. It also said that those from poorer backgrounds in Puerto Rico were 45% more likely to have been killed in the aftermath of the hurricane. The governor said he would sign an executive order to create a committee to examine and put into practice the report's recommendations. Puerto Rico has been reeling ever since the storm struck - with residents still suffering blackouts, broken infrastructure and a lack of services. It is ranked as the third most financially costly cyclone in US history since 1900, yet its death toll is a third higher than the costliest - Hurricane Katrina in 2005, with an estimated 1,833. What is Trump's plan for Puerto Rico? The new study raises questions about President Trump's response to the disaster. During a visit in October, Mr Trump had suggested officials should be "proud" the death toll - at the time only 16 - was not as high as "a real catastrophe" like Katrina. 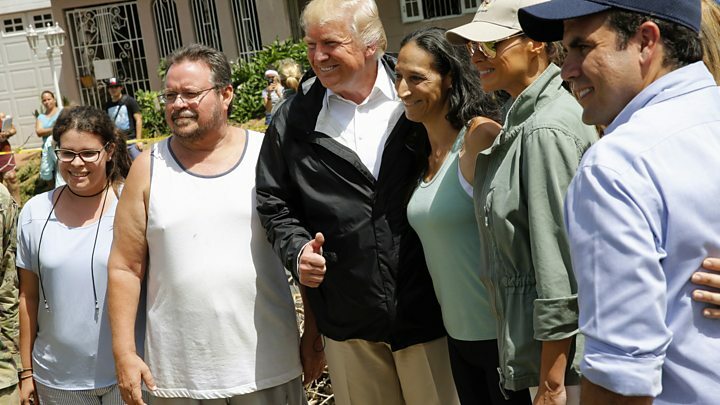 Video Is Donald Trump's visit to Puerto Rico too late?